The chicken salad with cashew nuts in a soya and ginger dressing, and the Korean pulled beef with kimchi and springonions. We ate it all, it was good, but lacked the hoped-for zing. On the steepening slopes of Table Mountain’s southern flank, dappled by the shade of towering iconic century-old stone pines which intersperse the view over the city to the harbour, sits a gem. 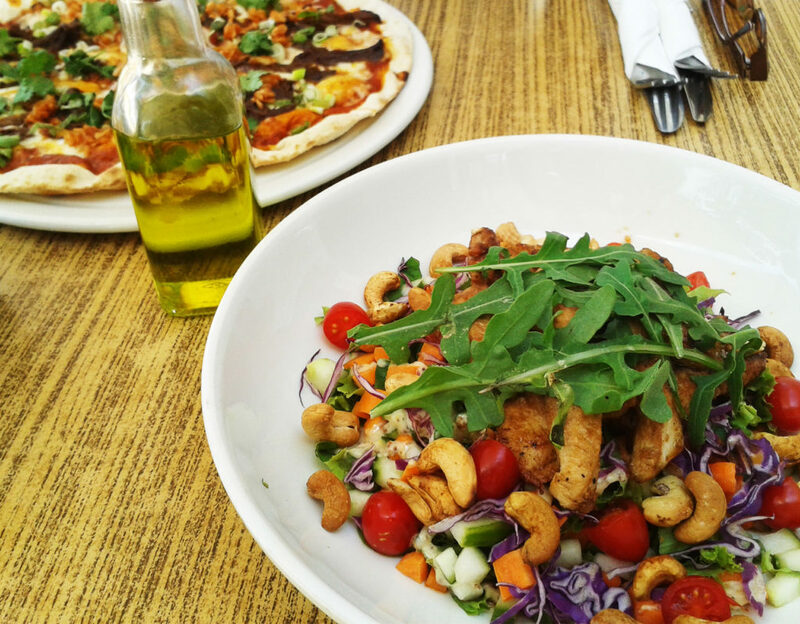 Beloved by locals, especially those with children and dogs because it borders a fenced-in park for romping, the Deer Park Café is the most well-known secret eating spot in Vredehoek. Large plate glass windows framed by warm wood create space and light, with unaffected Nordic-style blonde wood chairs and tables on a strip wood floor helping to make if feel clean and uncluttered. Contemporary, with frosted glass panels on the long bar and shiny chrome coffee machine and other whatnots. Yet at the same time refreshingly unpretentious. Perhaps because it really is a neighborhood hangout. Staff were quick to greet us and invite us in, which made us feel welcome. It’s an 8am to 8pm café, every day of the week, serving breakfasts and mains. We arrived for lunch. It was about half-full. We sauntered past moms meeting up for chats, dads with their kids, a few trail runners in sports gear, a well-known journalist talking loudly to another chap, and schoolkids from Herzlia, which is just across the road, and sat down at a veranda table. Best view, you see, and quieter. It was a choice of burgers or pizzas on the menu, and a kiddies section, which doesn’t sound too exciting, but they put together some interesting combinations. The vegetarian Mexican black bean burger, for instance, or the Korean beef pizza with spicy kimchi and spring onion. Curiosity about the kimchi, which is a Korean dish of fermented Chinese cabbage, convinced us. The varied selection of specials, which change two or three times a week, also tempted us with a smoked salmon linguine, but being a hot day, it was the chicken and cashew nut salad that landed the hook, particularly as it offered the zing of a soya and ginger dressing. Franklin brought the lime & sodas with cheerful ease, and the food arrived about 25 minutes later, which was fine, because we had some Friday afternoon time on our hands, but we would have become anxious if we only had a lunch hour. Children playing on the roundabout kept us entertained, along with the odd high school pupil taking the public path across the park. Nobody else seemed like they were pressed for time either. It was Friday afternoon, in Cape Town, after all. Perhaps there’s more of a buzz in the air on a Tuesday, but given the Café’s mountainside position, it’s likely to be school-run parents, and schoolchildren, and homework. The odd city-dwelling professional or freelancer might also be spotted. Who knows? The Korean pulled beef pizza was a pleaser. It was delicious. It was cheese and meat and fermented things. A good combination. But it could have been tastier, more kimchi. The base was good – thin and crispy. Coriander over it was lovely, but limp. Seemed to have been standing around in the heat too long. Little things would have really lifted it. Flavour was full, but more prosaic than hoped. The beef and the cheese is so rich and heavy that the freshness of the spring onion and coriander is quite important. You need something to cut through the richness. Spring onions had been bulk-chopped beforehand and were going dry at the edges. Need to cut those babies right before you serve, and the cool fresh droplets need to be shaken from the herbs. Are we asking for too much? The cashew nut and chicken was good, I ate it all, and it was a generous serving. Surprisingly, because I’m not fond of carrots in salad. But here they were chopped into small cubes and complemented the dry crunchiness of the cashews. Chicken was satisfying, and they say everything’s free-range, so. Chef’s not gonna get away that easily though. The rocket didn’t have those little diamonds to show it had just been shaken under a crystal stream, and that zing wasn’t so zingy. Someone also did a little cheat with a Greek dressing. The mustard seeds gave it away. It was all good though, nothing to complain to the kitchen about, just a leettle bit of disappointment at the lack of taste adventure, and the heat of the day did mitigate for the drooping greens, to be fair. A good cappuccino, friendly and suitably efficient service, and a great venue with a relaxed atmosphere added the piquancy the food may have lacked. It’s a great spot if you live in Gardens or Vredehoek, in which case you probably frequent it quite often, even if only for a cup of coffee and a 15-buck vanilla cupcake. Opening up onto a public park, and the view, certainly makes it worth a trip up from the City Bowl. And it’s just across from a MyCiTi stop. Deer Park Café is a part of the local landscape but under threat, just like the landscape generally. The community has rallied against the landlord’s plans to build a four-storey block of flats and appealed to Heritage Western Cape (HWC). Although the building itself doesn’t qualify for heritage status, HWC is assessing the social and community amenity value of the site. Let’s hope they make the right decision, and neighbourhood is not abandoned in favour of profiteering. Once you’ve been there, you’ll join the fight to keep it, even if it is very white, for now. The R330 bill (including tip) was paid for by The Critter.